Since we are talking about the only girl in a sea of boys, we went for some girly details in her Los Angeles newborn photography session with us. First, we started with our clean fabric shots using one of my favorite dusty pink backdrops from Roses and Ruffles. 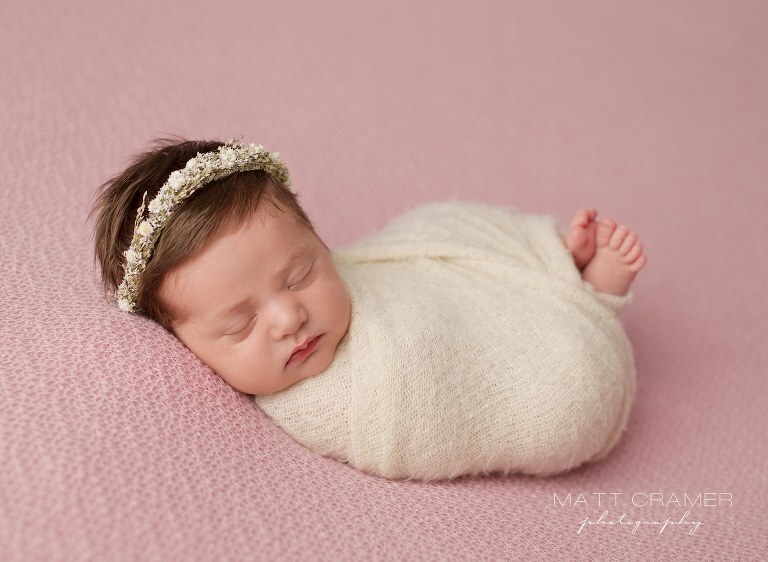 I’m very particular about the pinks we use here in the newborn photography studio! Only muted and contemporary palettes are allowed! 🙂 This look was topped off with a gorgeous dried floral baby’s breath crown which sat perfectly in all that beautiful hair! Mom loved this shot so much, she chose it for the birth announcement! At mom’s request, we went for an all cream set up next. This sweet girl’s name is very angelic. So we planned for an ethereal, soft and dreamy set up. Here she is totally snug as a bug in one of my favorite hand knit wraps. That sweet little mini floral headband ties the look together! I love it when we catch a dreamy smile too! Her little smirk is adorable here! 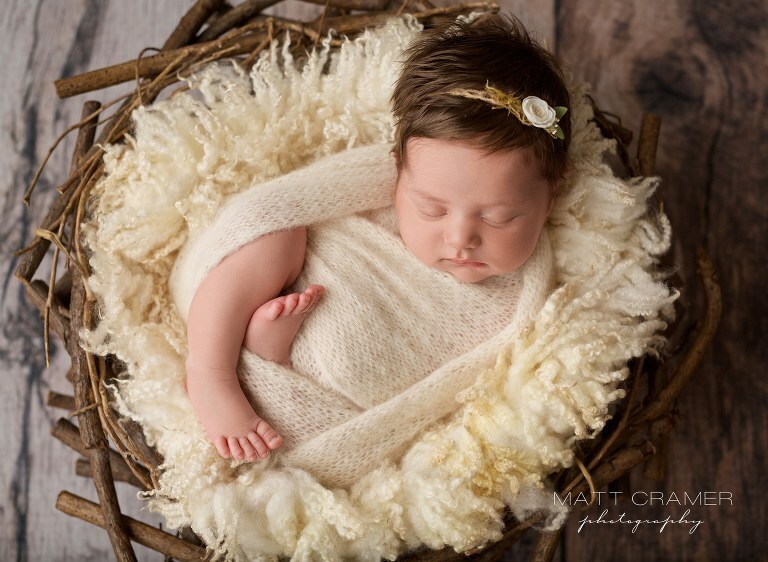 Capturing details are always a part of our newborn photography session workflow. 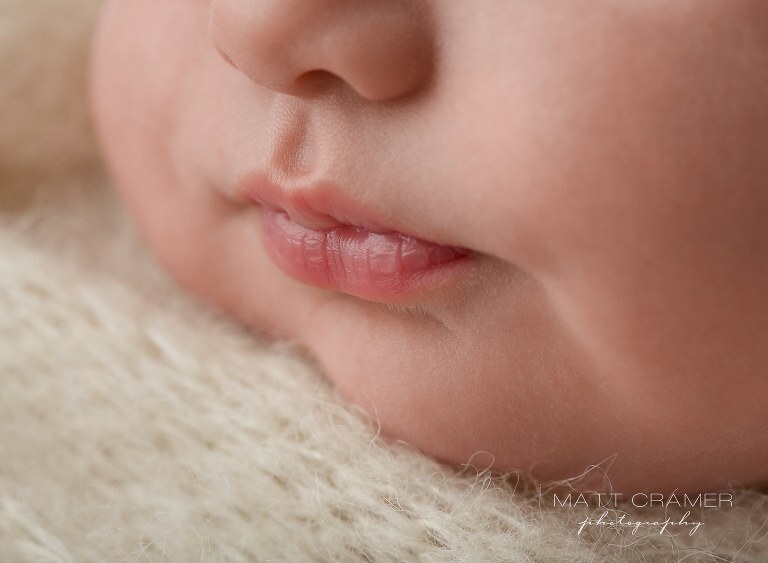 Those tiny little lips and toes! So sweet! If baby is sleeping deeply, we try for a quick, cute bucket shot! This matching little bonnet and wrap set is a MUST! I loved it so much I bought it in two colors! The bonnet frames her face beautifully. When she was in the little bucket, Matt switched to his macro lens to get a few close ups. Right when he went in for a shot, she flashed this sweet smile! Talk about timing! At the end of the session, we finished with this little baby bed prop. Added to our huge prop collection earlier this year, it has quickly become a parent favorite! I love to pair this set up with one of our handmade teddy bears, too. During this look, I quietly called Mom over to come take a closer peek. SWOON! She was in love and started tearing up. Then I started tearing up, and now we were both teary eyed over how beautiful her sweet girl was. The pink and cream floral headband is the icing on the cake! This session was so much fun and we are so humbled every time a family chooses us as their newborn photographer in Los Angeles.